For the first time, physicists have used laser light to create "synthetic magnetism," an exotic condition in which neutral atoms suddenly begin to behave as if they were charged particles interacting with a magnetic field -- even though no such field is present and the atoms have no charge. The achievement provides unprecedented insights into fundamental physics and the behavior of quantum objects, and opens up entirely new ways to study the nature of condensed-matter systems that were barely imaginable before. 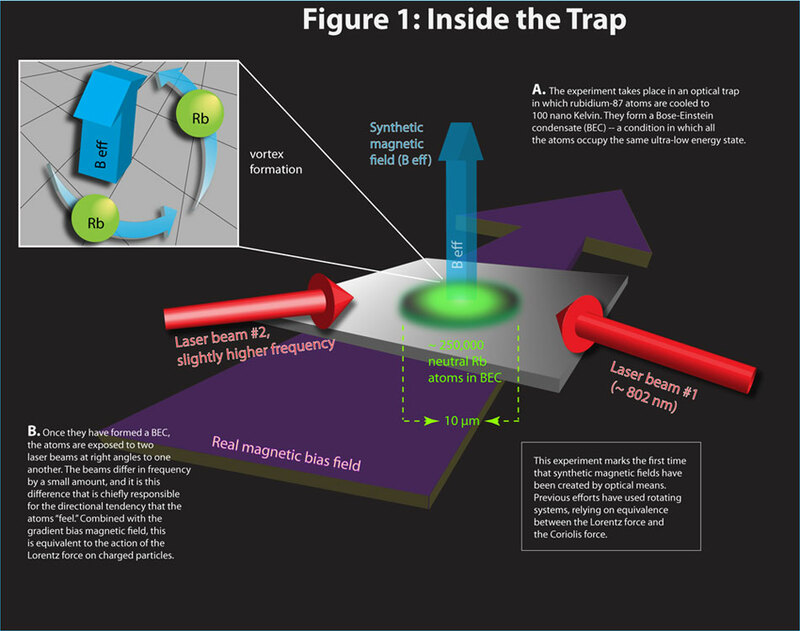 In the experiment, a Bose-Einstein condensate (BEC) of rubidium atoms was irradiated by two near-infrared (wavelength, λ=801.7 nm) laser beams, oriented at 90 degree angles to each other. The scientists adjusted the beams to have very slightly different frequencies. The cumulative effect of the two beams, in conjunction with a weak magnetic bias field, altered the properties of the atoms (in particular, their momentum along one axis) in a way that depended on their location in the trap and their interaction with the beams. Those differences, the researchers found, could be tuned by making slight changes in the frequencies of the laser beams, in effect conferring a “charge” on sub-populations of the neutral atoms and creating a synthetic magnetic field to which they reacted. As a result, groups of atoms began to form vortices within the BEC.